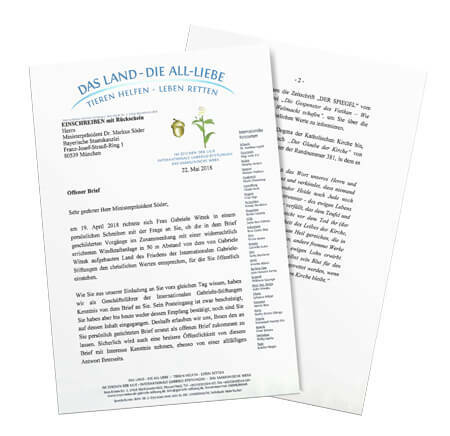 Read the open letter which Gabriele, the founder and originator of the International Gabriele Foundations, wrote on April 19, 2018, as well as the open letter from the managing directors of the International Gabriele Foundations, written on May 22, 2018, both to the Bavarian Minister President Dr. Markus Söder. No answer came from either letter. But no answer is also an answer. Perhaps you have an answer for Minister President Söder? After the Administrative Court of Würzburg rescinded in May 2015 the unlawfully granted permit for the wind turbine located directly on the border of the land of the International Gabriele Foundations, and the Bavarian Administrative Court rejected the operator’s application for an appeal in October 2015, (details are at the bottom of this page), the wind turbine is still standing without a permit and has not been dismantled despite its illegality. We want this illegal construction to be finally removed. Meanwhile, we have learned that there are even attempts to again grant a permit for this illegal wind generator and put it into operation, before the legality of this permit renewal can be reviewed by independent courts. This renewal is supposed to be granted now, when particularly many birds and bats are flying and would thus be threatened with death by the operating wind turbine. We would like to again ask all the friends of the International Gabriele Foundations to support us with their signature, so that this wind power generator is finally torn down and no new permit is granted. 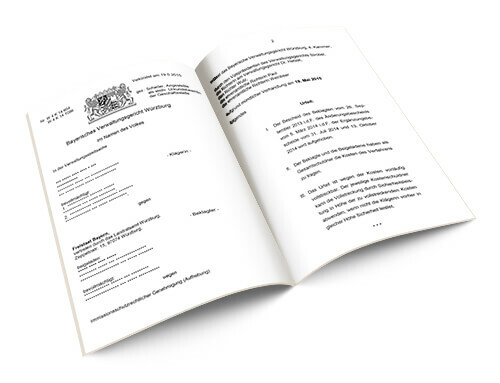 You will find more information on the signature campaign, as well as the possibility to download signature lists, and/or directly give your signature online under our link: Signature Page. In its verdict of May 19, 2015, the Administrative Court of Würzburg rescinded the permit for the wind power turbine. 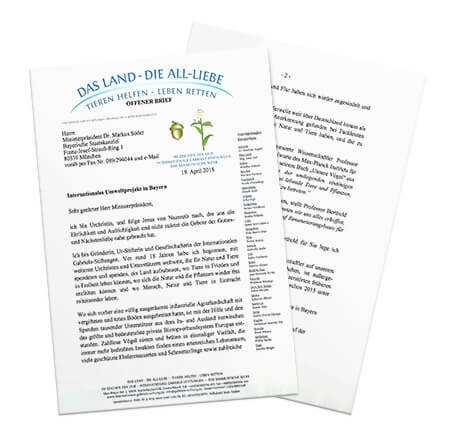 With its decision on October 22, 2015, the Bavarian Administrative Court rejected the application of the operator of the wind turbine for approval of the appeal. Therefore, the ruling of the Administrative Court Würzburg on May 19, 2015 is final. For more information, you will find (in German) the text of the verdict rendered by the Administrative Court of Würzburg on their press page.